One of the many Mardi Gras throws which krewes fling into the crowds, doubloons are large coins, either wood or metal, made in Mardi Gras colors. 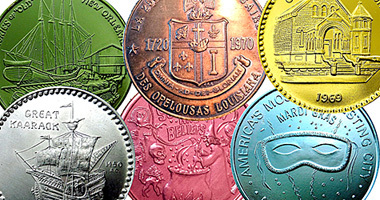 Artist H. Alvin Sharpe created the modern doubloon for The School of Design (the actual name of the Rex organization). According to the krewe history, in January 1959 Sharpe arrived at the offices of the captain of the krewe with a handful of aluminum discs. Upon entering the office, he threw the doubloons into the captain’s face to prove that they would be safe to throw from the floats. Standard krewe doubloons usually portray the Krewe’s emblem, name, and founding date on one side, and the theme and year of the parade and ball on the other side. Royalty and members of the court may throw specialty doubloons, such as the special Riding Lieutenant doubloons given out by men on horseback in the Rex parade. In the last decade, krewes have minted doubloons specific to each float. Krewes also mint special doubloons of cloisonné or pure silver for its members. They never throw these from the floats. Original Rex doubloons are valuable, but it is nearly impossible for aficionados to find a certified original doubloon. The School of Design did not begin dating their doubloons until a few years after their introduction. The flambeau (“flahm-bo” meaning flame-torch) carrier originally, before electric lighting, served as a beacon for New Orleans parade goers to better enjoy the spectacle of night parades. The first flambeau carriers were slaves. Today, the flambeaux are a connection to the New Orleans version of Carnival and a valued contribution. Many people view flambeau-carrying as a kind of performance art – a valid assessment given the wild gyrations and flourishes displayed by experienced flambeau carriers in a parade. Many individuals are descended from a long line of carriers. Parades that commonly feature flambeaux include Babylon, Chaos, Le Krewe d’Etat, Druids, Hermes, Krewe of Muses, Krewe of Orpheus, Krewe of Proteus, Saturn, and Sparta. Flambeaux are powered by naphtha, a highly flammable aromatic. It is a tradition, when the flambeau carriers pass by during a parade, to toss quarters to them in thanks for carrying the lights of Carnival. In the 21st century, though, handing dollar bills is common. One of the most famous and the most sought after throws, is the Zulu Coconut also known as the Golden Nugget and the Mardi Gras Coconut. The coconut is mentioned as far back as 1910, where they were given in a natural “hairy” state. The coconut was thrown as a cheap alternative, especially in 1910 when the bead throws were made of glass. Before the Krewe of Zulu threw coconuts, they threw walnuts that were painted gold. This is where the name “Golden Nugget” originally came from. It is thought that Zulu switched from walnuts to coconuts in the early 1920s when a local painter, Lloyd Lucus, started to paint coconuts. Most of the coconuts have two decorations. The first is painted gold with added glitter, and the second is painted like the famous black Zulu faces. In 1988, the city forbade Zulu from throwing coconuts due to the risk of injury; they are now handed to onlookers rather than thrown. In the year 2000, a local electronics engineer, Willie Clark, introduced an upgraded version of the classic, naming them Mardi Gras Coconuts. These new coconuts were first used by the club in 2002, giving the souvenirs to royalty and city notables. 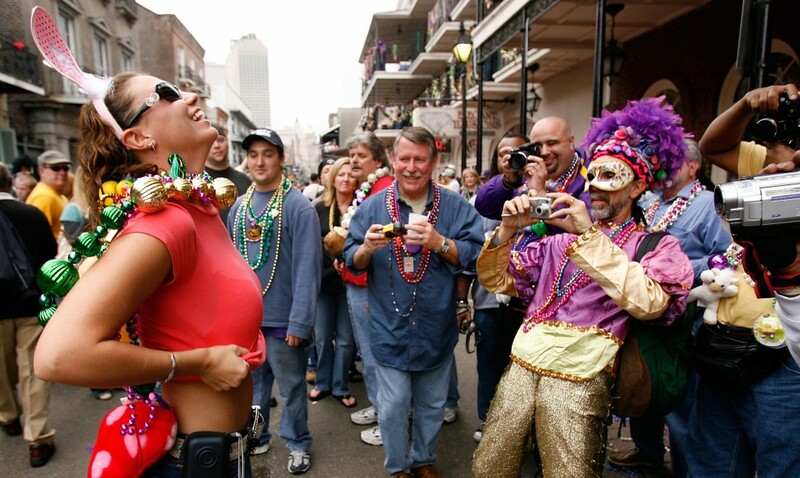 Women showing their breasts during Mardi Gras has been documented since 1889, when the Times-Democrat decried the “degree of immodesty exhibited by nearly all female masqueraders seen on the streets.” The practice was mostly limited to tourists in the upper Bourbon Street area. In the crowded streets of the French Quarter, generally avoided by locals on Mardi Gras Day, flashers on balconies cause crowds to form on the streets. The formal end of New Orleans Mardi Gras arrives with the “Meeting of the Courts,” a ceremony at which Rex and His Royal Consort, the King and Queen of Carnival, meet with Comus and his Queen, at the ball of the Mistick Krewe of Comus, New Orleans’ oldest active Carnival organization. The Meeting of the Courts happens at the conclusion of the two groups’ masked balls, which in modern times have both been held at the New Orleans Municipal Auditorium. Following Hurricane Katrina, the ball has been held in the Marriott Hotel. Promptly at the stroke of midnight at the end of Fat Tuesday, a mounted squad of New Orleans police officers make a show of clearing upper Bourbon Street where the bulk of out-of-town revelers congregate, announcing that Carnival is over, as it is the start of Lent, commencing with Ash Wednesday. Ash Wednesday (the day after Big Tuesday) is sometimes jokingly referred to as “Trash Wednesday” because of the amount of refuse left in the streets during the previous day’s celebrations and excesses. The tons of garbage picked up by the sanitation department is a local news item, partly because it reflects the positive economic impact of tourist revenue.